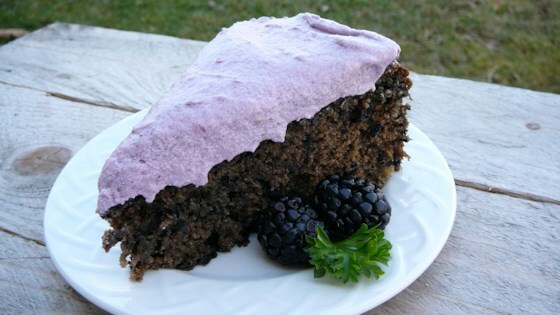 "This yummy blackberry cake is yummy year-round. I especially love it served warm for dessert in the winter, because the spices warm me up!" Preheat oven to 350 degrees F (175 degrees C). Grease a 9-inch cake pan. Stir milk and vinegar together in a small bowl; set aside to sour for 5 minutes. Beat white sugar and 3/4 cup butter together in a bowl using an electric mixer until creamy and smooth; beat in eggs, soured milk, baking soda, cardamom, cloves, and nutmeg. Gradually stir in flour until just incorporated. Fold in 1 cup blackberries. Pour batter into the prepared pan. Bake in the preheated oven until a toothpick inserted in the center of the cake comes out clean, 25 to 35 minutes. Allow cake to cool. Beat confectioners' sugar and 1/2 cup butter together in a bowl using an electric mixer until smooth and creamy; mix in 1/2 cup blackberries and milk until frosting is desired thickness. Spread icing on the cooled cake; sprinkle with coconut and pecans. Buttermilk can be used in place of the milk and vinegar step.